OCOs are a pair of orders (or more) which are logically tied together in a sense that, if one order is executed, the other(s) are automatically canceled. This order type is applicable to pending orders only. How to setup OCO orders in Metatrader using VTC? Once you have at least 2 pending orders already setup in Metatrader, you can tie them up as OCOs. Now you need to click the “OCO selected” button located on the bottom of the VTC application widow. You need to select individual orders by clicking on the check boxes in the check box column, next to the pending order account & ticket numbers. A checked box will indicate that the order has been selected. Notice, you can also OCO orders across multiple accounts. When this is done, you’ll notice that the labels on the selected OCO buttons in the “Clear [OCO]” column will have a ticket number of the first order in the OCO group. 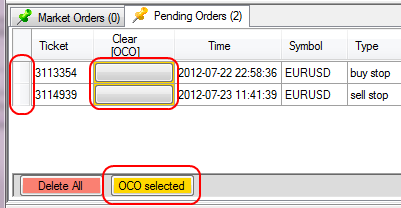 Once any one of the OCO orders is triggered the remaining orders (from the OCO group) will automatically get deleted. How to add OCO orders to an existing OCO group? This can be done by following the steps described above – generally, you should setup the group form the start, but this time you need to additionally include the new orders as well. 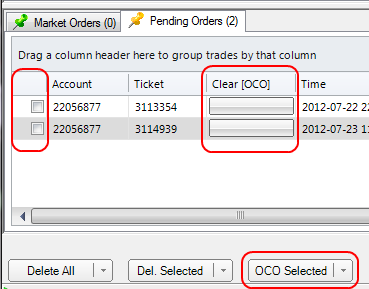 How to remove OCO orders from the OCO group? You can remove an OCO order from the group by clicking the OCO button in the “Clear [OCO]” column. This action will remove the selected order from the OCO group and will also remove the group in there are only 2 orders on the group. Is it possible to have OCO orders on more than one currency pair? For example, I can set up an OCO on GBPUSD with a pending buy stop and a pending sell stop, but can I also add another OCO on EURUSD with two similar pending orders? Thanks. Yes. This way as soon as one of the OCO orders belonging to the same group is triggered, all remaining orders from the same OCO group will be deleted. What I meant was: can I have two GROUPS, one for each currency pair, so that when the GBPUSD buy triggers it only deletes the GBPUSD pending sell, and leaves the two EURUSD pending orders in place as they would be in a separate group? Thanks. You can have many OCO groups, but a single ticket (pending order) can only belong to a single OCO group. Hope this answers your question.